Think of something to do for Haiti today. When a country has a large earthquake that destroys building, trapping thousands of people in the rubble, it is as if the country has had a stroke: time is brain. Fast help can make a major difference. Haiti is the poorest country in the Western hemisphere. Haiti has had a huge earthquake. 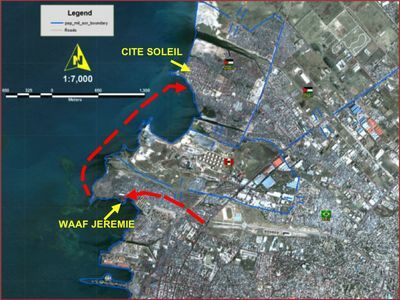 News reports paint a grim picture: the capital city of Port au Prince largely destroyed, possible death tolls in the 100,000s, UN Headquarters collapsed with UN personnel trapped inside. Port au Prince is a city that grew fast with little oversight of building codes and the quality of construction. In a major earthquake, poor construction means death. Do something today to help. Don't wait. The Maproom is collecting links to online maps intended to help with disaster relief. Here is a Goole Earth KML of a map I made of the area in 2006 in connection with the Haitian elections. (Or you can view the map online at CommunityWalk. It has some relevant landmarks such as the Presidential Palace and the airport. Do send money to one of the charities, such as the Red Cross, that is sending aid. But don't stop there. Your ideas can be more valuable than your cash. Think of innovative was to save these people. Haiti's electoral council says the second round of parliamentary elections will be delayed. I just discovered this morning that the strange, secretive private intelligence company Consultants Advisory Group (CAG) has a blog. I'm trying to figure out how to stuff it and mount it properly to be hung on my wall. I have a letter in to UN Legal inquiring about the relationship between MINUSTAH and CAG. 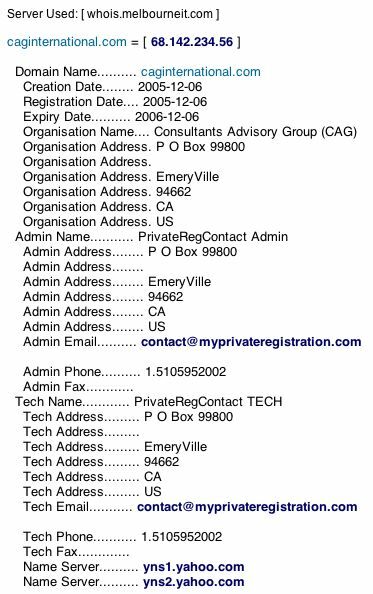 The CAG site (including blog) is sitting on a Yahoo server in Sunnyvale, CA, near as I can tell. A high-ranking official from the Organization of American States, who insisted on anonymity because of the fragile nature of the agreement, said on Wednesday night that loopholes in Haitian electoral law allow the government to discard an estimated 85,000 blank ballots included in the original tally. By excluding them, Mr. Préval's lead would increase from 48.7 percent of the votes to slightly more than 51 percent. PORT-AU-PRINCE, Haiti -- Officials of Haiti's interim government and electoral council announced early today that they had reached agreement to declare front-runner René Préval the winner of Haiti's presidential elections. "We acknowledge the final decision of the electoral council and salute the election of Mr. René Préval as president of the republic of Haiti,'' Prime Minister Gerard Latortue told the Associated Press. Former President Préval was just a hair short of the 50 percent-plus-one majority he needed to win the Feb. 7 vote without a runoff, and the discovery of thousands of crumpled ballots at the municipal dump diminished hope that a vote recount would offer Haitians any greater confidence in the electoral process. Only political negotiations, foreign experts said, could resolve the situation. "The margin of uncertainty is larger than the margin of victory and defeat,'' said a fraud specialist for the International Mission of Evaluation of Elections in Haiti, who asked to remain anonymous because the group leaders have been prohibited from speaking publicly about the balloting. "The only solution now is a political solution,'' the specialist told a Knight Ridder reporter who went to the city dump Wednesday morning. Preval pulled more than four times the votes of any other candidate. PORT-AU-PRINCE, Haiti (Reuters) - Haiti's electoral council said on Tuesday it would launch an investigation after burned ballots, many cast a week ago for former president Rene Preval, were found still smoldering in a state dump. Preval, a one-time ally of ousted president Jean-Bertrand Aristide opposed by the same wealthy elite who helped drive Aristide from power two years ago, said on Tuesday that only "massive fraud" had prevented him from winning a first-round victory in the February 7 election. A few hours later, reports that hundreds and maybe thousands of ballots had been found discarded in a massive garbage dump in Port-au-Prince rippled through the ranks of Preval supporters, triggering anger and demonstrations after nightfall. "That's absolutely unacceptable," said Rosemond Pradel, secretary-general of the Provisional Electoral Council (CEP) charged with organizing the impoverished Caribbean country's presidential election -- the first vote since Aristide was ousted by an armed revolt and international pressure to quit. "The CEP was not handling the ballots," Pradel said. He said securing the ballots after they had been cast was the responsibility of the 9,000-strong U.N. force trying to keep the peace in Haiti, known by its acronym MINUSTAH. "I cannot answer to those problems but we are going to set up a commission to investigate the problem," Pradel said. U.N. spokesman David Wimhurst said ballots were supposed to have been sealed in bags and placed in a container, protected by U.N. troops. "It's not normal to have these ballots there." 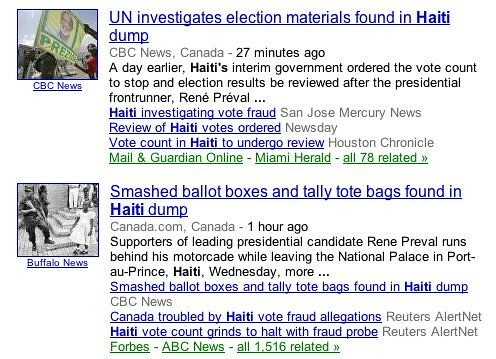 Election manipulation in Haiti is no joke. Only a few in the mainstream press, as of yet, have covered these burned/trashed ballots. Today vote monitors and members of AUMOHD discovered piles and piles of burned and trashed ballots marked for Preval. Here are some photos. AUMOHD writes, "Thanks to our volunteer accompanier, Jared Sibbitt, here are three of pics of the burned ballots. Our information is that these were found in an area called Marcial near Cite Soleil. I have placed more pics on our website since this listserve has some limits on size of messages." From AP: "We expected these MREs to do anything in their power to steal the elections and they did not disappoint us. Guy Delva of Reuters News Agency reported that hundreth and possibly and possibly thousands of burnt and still smoldering ballots, many cast a week ago for Preval, were found on a Port-au-Prince garbage dump, outraging Preval supporters and setting off demonstrations after nightfall. "Steve Jacobson of AP also reported Local Telemax TV news Tuesday night showed smashed white ballot boxes in a garbage dump, with wads of ballots strewn about. Ballot after ballot was marked for Preval." Corbbet Lister Patrick Tortora writes, "On Haitian Television Channel 5 this evening a cameraman was following Haitians who were taking him through a rubbish dump near Citi Soleil. The people leading the cameraman around were showing hundreds if not thousands of presidential ballots that had been marked for a presidential candidate and signed on the reverse by an official of the Electoral Council. All the ballots that were shown to the camera were marked for Preval. There were also many cardboard ballot boxes littering the dump. The inference was that legally marked ballots were dumped in the landfill. Even if these ballots were counted before being discarded, what were they doing in the dump before all ballots were counted and before election result were announced, not to say anything about a possible recount?" Meanwhile, David Wimhurst, of MINUSTAH continues his attempts at covering up this mess. Wimhurst said it was possible someone dumped the ransacked ballots to create an appearance of fraud. Wimhurst also said there was no evidence of fraud. The U.N. provided security for the vote (much like they provided "security" for the Haitian National Police while they have massacred poor Haitians for the last two years) and helped ship election returns to the capital but is not directly involved in counting ballots. Coup President Boniface Alexandre's chief adviser Michael Brunache announced the votes will be reviewed by a commission which will include presidential candidate Rene Preval's attorneys. Why were these ballots thrown in the trash heaps and why are so many of them burned? 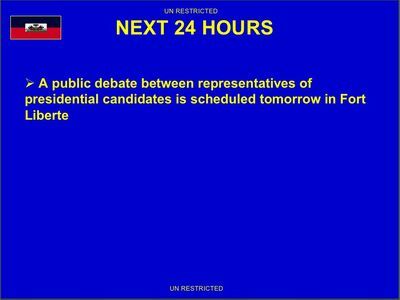 Haiti's interim CEP has some explaining to do. Haitian Election: "two of nine members of the elections council have themselves alleged fraud, blaming the council's director general, Jacques Bernard." Connie Watson has distorted the truth in her reports consistently on CBC radio, one of the few outlets that you would expect to find a more serious commitment to the facts. Reproduced here is a letter of complaint from Dr. James Winter. Your correspondent in Haiti, Connie Watson, reported this morning that dissatisfaction with vote counting and allegations of fraud are coming entirely from the poor and disenfranchised in Haiti, who support Rene Preval for president. Nowhere to be found was mention of what Reuters reported yesterday: two of nine members of the elections council have themselves alleged fraud, blaming the council's director general, Jacques Bernard. "Pierre Richard Duchemin and Patrick Fequiere, two of the nine members of the elections council, said the vote tabulation was being manipulated and blamed Bernard," Reuters reported. "There is an unwholesome manipulation of the data," concluded Duchemin. You do a disservice to your listeners when you omit crucial information such as this from your report. Indeed, CBC News On line has an excellent report on this, which apparently your correspondent has not read. Must we go on line to get the news, or can we rely on radio news to give us a complete report? 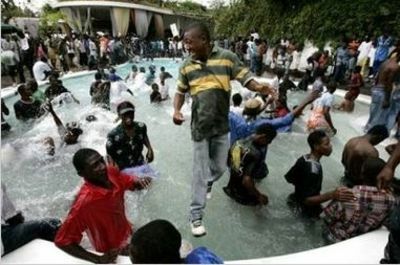 The Hotel Montana as a setting for the Haitian Election Drama: "This is a wonderful day to see the children of Cite Soleil swimming in the pools of Hotel Montana." "un site unique, une histoire d'atmosphèrs . . ."
I wish we could talk about this over a fine cup of Haitian coffee so that you could enjoy the beautiful [view] from the Hotel Montana. It’s breathtaking. The hotel is the scene of the alleged suicide of General Bacellar, head of MINUSTAH, the UN peacekeeping forces on January 7th. It's my impression that it's the hotel where Brad Pitt and Angelina Jolie stayed as they passed through. And it's where that guy "David Reuther," who was trolling in my comment section a while back claimed to be staying. Watching the Haiti feed on Flickr, I've watched guests come and go at the Montana. I've seen guest's shots of the pool, the restaurant, and that view of which Val Sedecki spoke so highly. About a week ago, just before the election, I wrote a fictionalized account of the Haitian election drama, revolving around one "Hotel California," entitled "Duck Soup in the 21st Century." It is currently on submission (as fiction) to a major magazine. The ending of this first draft involves a crowd bursting into the hotel lobby and shots being fired (just as Mrs. Teasdale is checking out). Supporters of Haitian presidential candidate Rene Preval erected smoldering roadblocks across the capital and occupied a luxury hotel Monday. At least one protester was killed, but U.N. peacekeepers denied witness accounts that they had shot him. Now. Who speaks for the UN Peacekeepers? My God, if it isn't David Wimhurst. (For anyone who has been following this space, Wimhurst has zero credibility with me.) And was it the Hotel Montana? Oh. Yes. It was. "MINUSTAH killed my brother. MINUSTAH, killed my brother," a woman wailed. Meanwhile, in the Petionville neighbourhood above Port-au-Prince, protesters converged on the upscale Montana Hotel where election officials have announced results of Tuesday's elections. UN peacekeepers kept close watch from a driveway and rooftops as protesters squeezed into the hotel's lobby and down the steep sloping driveway, waving posters and tree branches and chanting: "Now is the time! Now is the time!" 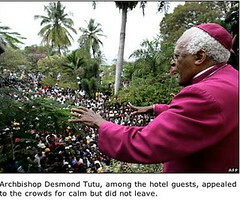 South African Nobel Peace Prize laureate Desmond Tutu, who had appealed for calm at church services Sunday, was seen on a balcony surveying the crowd as helicopters landed on the roof to evacuate people. To those staying at the Montana: I know you've all got digital cameras. Please go up to your rooms and upload your pictures of the incident to the Internet. David Wimhurst needs to know that the whole world is watching; that now all of us are the Eye in the Sky; that in the 21st Century, things will be different and better. With about 90 percent of the vote counted, Preval was leading with 48.7 percent, Haiti's electoral council said on its Web site. His nearest opponent was Leslie Manigat, another former president, who had 11.8 percent. But of the 2.2 million ballots cast, about 125,000 ballots have been declared invalid because of irregularities, raising suspicion among Preval supporters that polling officials were rigging the election. Another 4 percent of the ballots were blank but were still added into the total, making it harder for Preval to obtain the 50 percent plus one vote needed. Jacques Bernard, director-general of the nine-member electoral council, denied accusations that the council voided many votes for Preval. Council member Patrick Fequiere said Bernard was releasing results without notifying other council members, who did not know where Bernard was obtaining his information. And another council member, Pierre Richard Duchemin, said he was being denied access to the tabulation process. "According to me, there's a certain level of manipulation," Duchemin said, adding that "there is an effort to stop people from asking questions." Anyone got GPS coordinates of the Hotel Montana? I would love to be able to mark some of this stuff one Google Earth. 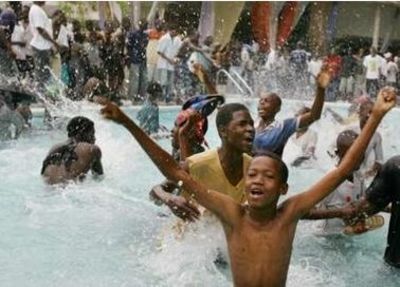 This is a wonderful day to see the children of Cite Soleil swimming in the pools of Hotel Montana. Today, after officials within the CEP have criticized other officials for vote tampering and one demonstrator was killed (reportedly by UN MINUSTAH forces), the Haitian masses from Bel Air, Cite Soleil, Delmas, and other neighborhoods have marched on Hotel Montana. UN troops were landed by helicopter on the Hotel's roof. Here are some photos from Yahoonews. The people came down the road meaning buisness. They demanded that their vote be respected. Here is the rest of the photoset. [UPDATE: I'm not sure what happened. That whole photoset vanished. here's the photostream it came from; maybe the photographer found a buyer.] FURTHER UPDATE: Now the photo is back up. HERE is a link to a big version, and HERE is a link to the photoset. "You watch my back and I'll say cheese"
The photographer is Tony Allen-Mills, a journalist for the Sunday Times of London. This is part of an ongoing series on Consultants Advisory Group. The Council is expected to renew the mandate of the UN Stabilization Mission in Haiti (MINUSTAH), which expires on 15 February. After a very bad month for both MINUSTAH and Haiti in January the Council will also be looking to bolster the electoral process, reinvigorate MINUSTAH and encourage a reduction in violence. Haiti's presidential elections were postponed for the fourth time in late December on the grounds that technical difficulties were unresolved and that insecurity was hampering the electoral process. The Council, increasingly concerned at the performance of the Transitional Government, adopted a presidential statement on 6 January, urging the quick announcement of another election date no later than 7 February. 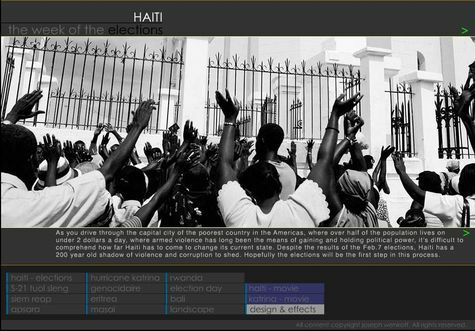 Haiti's Provisional Electoral Council subsequently declared 7 February as the date of the first round of elections, with a run-off on 19 March if necessary. The official transfer of power to a newly elected leader is scheduled for 29 March. The security situation deteriorated dramatically, with many kidnappings and assassinations as well as the death of two UN peacekeepers. Sectors of the local business community mounted a campaign to discredit MINUSTAH. The campaign was condemned by the UN Secretary-General. MINUSTAH's Force Commander, General Urano Bacellar of Brazil, committed suicide. Since MINUSTAH's David Wimhurst has accused me of participating in the alleged campaign to discredit MINUSTAH, I'll throw in my two cents. and which may well not be registered as a corporation at all. Stop providing CAG with Internet access via IP# 200.2.128.3, which (though they use it more sparingly than in the past) they continue to make use of. And . . .
Get CAG out of Haiti. I have no idea of whether the business community there is trying to bring down any unfair criticism on MINUSTAH's head. But just days ago, MINUSTAH's David Wimhurst refused to answer my questions about CAG, choosing instead to threaten me with UN legal action. No good purpose can be served by a United Nations organization associating itself with an outfit with the furtive habits of CAG. If MINUSTAH continues to associate with and cover for CAG, they are discrediting themselves. Now that I completely dumped on PowerPoint yesterday, I did want to remind people of our friend Peter Watts' brilliant piece of very dark humor, "Vampire Domestication." I'm not sure we could say that "Vampire Domestication" redeems PowerPoint. It would probably be more accurate to say that it exploits what's wrong with the program to artistic effect. PORT-AU-PRINCE, Haiti, Feb 2 (Reuters) - U.N. peacekeepers are ready to secure Haiti's oft-delayed election with a rapid-strike force to put down any violence at polling stations, their commander said on Thursday. Wonder what the PowerPoint plan might look like. I just noticed via my Flickr photo-feed for the tag earthquake that there has been an earthquake in Tokyo (5.1 magnitude). 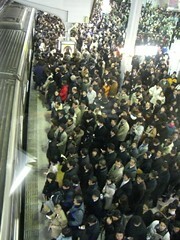 I looked at my earthquake Flickr badge and saw all these photos of the Tokyo subways, And sure enough, there was an earthquake today. I am working from how I tracked info on the situation in Pakistan following the earthquake, but this would work just as well for human rights violations. There's some really gruesome stuff in Flickr documenting the arrival of medical teams in remote places weeks after the earthquake that had had no relief whatsoever. I had never seen three week old untreated wounds before. And the people in the pictures look so grateful to finally be getting help. To document human rights violations, all they have to do is take digital photos and upload them to Flickr; tag them with relevant tags, like say HAITI and MASSACRE and such; geotag them: i.e. give lat and lon coords, or street address, or other really specific info. The photos come in date stamped in the first place with the data from the camera, but sometimes the camera is set wrong, so they want to be sure. And my additional advice to any one doing that wold be to add little or no political rhetoric, because what is important is for the objective observer over the Internet to ascertain that something happened and what it was. In Flickr, one can make what are called Flickr badges. I have a couple on my site. You can make Flickr badges with feeds for specific tags. I've got one for "earthquake", and one for "Google Earth" and also that's how the photos at the top of my page work. So you get the photos uploaded to Flickr. Then you can set up blogs all over the place with Flickr tags that will broadcast those pix. You can, at your leisure, add info to those blogs to go with the pix. Also, you don't have to have just one Flickr account. You can set up a new one each time you want to upload if your really want to. And there are other photo uploading services. That's just the one I know best and used to get hard info out of Pakistan after the earthquake and out of NOLA before that. One of my new years resolutions is that certain things are going to be different and better in the 21st century. This is a start, and it's only February 1st. After having been provided with the email address of David Wimhurst of MINUSTAH in Haiti yesterday morning, I sent Wimhurst a polite note asking him if I might submit to his office questions concerning Consultants Advisory Group. The response I received from him -- not befitting an employee of a "Communications and Public Information Office" -- was intended to intimidate me. I was duly intimidated. But now I've had a good night's sleep and I'm over it. First, however, I will attempt to address the questions Wimhurst claims I must answer. In the course of his unprofessionally rude and threatening letter, which I will show him the mercy of not publishing for the moment, what he seems to demand is any evidence in my possession that the PowerPoint presentation downloadable from my web site was altered by anyone for the purpose of undermining the UN operations in Haiti. Let me say unequivocally, for the record, that there is no evidence whatsoever in my possession that anyone doctored the PowerPoint presentation for the purpose of undermining the UN operations in Haiti. None. Zip. Zero. Sorry to disappoint. HOWEVER, there is an abundance of evidence in my possession, much of it unpublished, that the Consultants Advisory Group is an amateurish operation which changes its story whenever convenient; an outfit that makes the Keystone Cops look like pros. As nearly as I can tell, CAG's Valerie Sendecki initiated communications with me last month for the purpose of finding out how I learned of CAG and their connection to Top Cat Marine Security. Despite Sendecki's claims to have had lunch with Jordan Sage and later to have had her arrested and deported, my current thinking is that access to Sage's email account was gained by keystroke logging on UN-owned computers and that Sendecki and co. never knew her identity. What they had access to was her correspondence and her address book. My suspicion is that someone found Mariely Puello's name and phone number in Jordan Sage's email account and used the name to create a gmail account under her name. The Mariely Puello, whose phone number appears in the email I received, is not the author of the letter I was sent. How do I know this? She doesn't have the English skills. When I called her number and got her on the phone, we were unable to have a conversation. She and I have no common language. A third party has contacted me on her behalf and explained her situation, but it is frustrating because I am unable to converse or correspond with her. From what I understand, while she was visited by some police, she has nothing to do with the sending of the PowerPoint presentation. I'm told that she is a very good girl and that she is terrified. Further, Sendecki could not have had her detained in Haiti as Sendecki claimed, because Puello was not in Haiti at the time. There is no reason to expect that Puello even knows the identity of "Jordan Sage," even if she has corresponded with that person. Other than Valerie Sendecki's claim to have lunched with Sage, no one has yet come forward to say they know her. The name was not contained in the email address under which "Sage" wrote and is, I suspect, an alias. 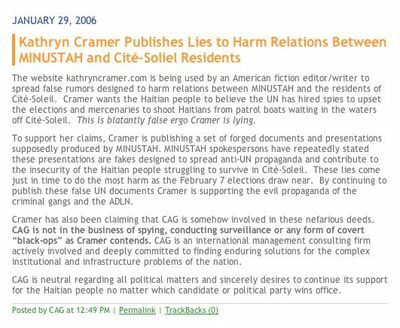 CAG may well, as they claimed, have had a few people in Haiti arrested. But if their intel was based on keystroke logging, CAG has no way of knowing if they arrested the right ones. So. Why do I think access to Jordan Sage's account was obtained by keystroke logging? Because otherwise CAG's whole clown circus of incompetent psyops operatives would not be after information that should already be in their possession. It is my belief that CAG's operatives have not been candid with their employer about the full extent of their attempts to do damage control on my discovery of their existence. Inasmuch as I have any evidence that a document might have been altered, this evidence suggests that it was an inside job conducted in the interests of CAG. Interestingly absent from Wimhurst’s letter is any hint that he is aware that I provided the “Puello” letter plus the PowerPoint presentation to two other people immediately upon receipt. It is my strong impression that CAG has communicated to Wimhurst neither the identities of these two people nor the contents of CAG’s communications with them. Wimhurst would be much more uncomfortable involving the UN legal office in this affair if he had received full disclosure from CAG. MEANWHILE, I hear through the grapevine that CAG's Jay Fullerton claims Sendecki has resigned. If Wimhurst were receiving full disclosure, Fullerton would also need to resign. 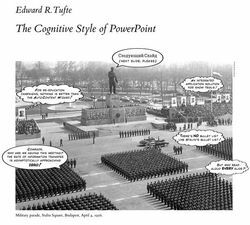 A few years ago, Edward Tufte published a book entitled The Cognitive Style of Power Point which I have been meaning to read some time. While I am a heavy user of both Microsoft Word and Microsoft Excel, until I got an enormous hard drive I used to routinely throw PowerPoint off my hard drive because I think it is a mostly useless and actively pernicious program. Another reason for PowerPoint's sudden spike in notoriety is that the program finally caught the attention of Edward R. Tufte, a professor of information design at Yale University. Often referred to as the world's leading guru of information design, Tufte's books – The Visual Display of Information, Envisioning Information, and Visual Explanations – redefined the art of presenting information in visual form (charts, tables, graphs, etc.). No one knows more about effective data design, and no one in the field is more respected. So when, in March 2003, Tufte published a 23-page denunciation of PowerPoint entitled "The Cognitive Style of PowerPoint," many people who had never before taken PowerPoint seriously began paying attention. It was Tufte who brought NASA's now infamous PowerPoint slide to the public's attention. It was Tufte's work that emboldened The New York Times to suggest that information manipulation via electronic slides may have helped Secretary of State Colin Powell make his case to the United Nations for declaring war on Iraq. And it is Tufte, in his 23-page screed, who uses such words as stupid, smarmy, incoherent, witless, medieval and dementia to describe the trivializing effect of PowerPoint slides on pure, defenseless data. Tufte doesn't stop short of calling PowerPoint evil – he does call it evil, most visibly in an excerpt published in Wired last year succinctly titled "PowerPoint is evil." Indeed, the photo on the pamphlet's cover is of a 1956 Russian military parade in which a statue of Stalin is depicted saying, "Next slide, please." If there is something right with PowerPoint, it is the program's ability to combine either images and text, or a sequence of bulleted items, in order to make an argument. The UN-restricted PowerPoint presentation I was provided with initially seems to make several layers of argument, a couple of which I am unhappy with. Though the authoring info on the document listed the author as “pkf” and the company as “UN,” the implicit narrative voice is that of CAG; one of the document’s arguments is how useful CAG is making itself. Though perhaps composed on UN computers, my sense is that the docment's author works for CAG. Slide 1: What might the point of this slide be? It seems to be lacking a point, but I’ll have a go at it: For those of you Peace Keepers fresh off the plane, Waaf Jeremie and Cite Soleil are on the coast, not in the mountains, and the coastline between them is completely surrounded by WATER! Slide 2: This page is a little sparse, too. Um, and why bullet something that’s all alone on the page? I’ll have a go at the voiceover: And men, remember, when creating PowerPoint presentations for military use, it’s very important to leave plenty of room to allow space for others to add their thoughts, so be sure to push the text as high up as you can. Also, the resulting expanse of blue will subliminally remind your audience that the Haitian coastline is completely surrounded by WATER! Look. Um. Wimhust. This is embarrassing. Are these really the originals from an actual PowerPoint presentation? The best face I can put on this is that these are the materials from which a final presentation might have been made, not the final presentation itself. 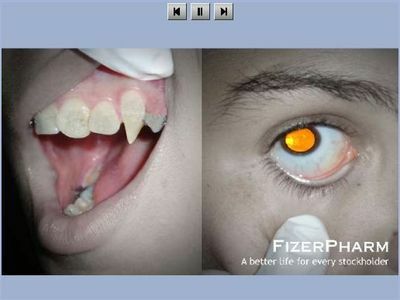 It is also possible that these really are slides from a real presentation. But if that is the case, the presentation’s author is incompetent to use the program and perhaps should explore some other mode of communication. This does not prove that the presentation I was emailed was in fact presented or that its contents mean what they appear to. But the incompleteness of Wimhurst's "originals" does call into question the plausibility of the only actual information I have received from MINUSTAH. In Wimhurst's one communication to me his prose style suggests his background is in yelling at people in uniform, not in answering questions. Who hired this Wimhurst guy, anyway? What I find most peculiar about Wimhurst's letter to me is that he seems to take the attitude that CAGs Clown Crew had already said what he had to say to me by proxy and that he had nothing further to add. Were Sendecki-Fullerton-Reuther really speaking for Wimhurst? Whether CAG is using the office computers of the Brazilian Peackeepers. All right then. He has no comment. I'll probably revisit that subject in a subsequent post. Noriegaville News: "Shadowy Panama Company Illegally Runs Black-Ops in Haiti"
Well. Dutch reporter Okke Ornstein, who lives in Panama and reports on business news there for the news site, Noriegaville News, took an interest in my writings about the Consultants Advisory Group. He contacted me and asked me questions, so I answered them. He contacted CAG, and I gather from his article that they were less forthcoming than I was. The result of this research is his article, Shadowy Panama Company Illegally Runs Black-Ops in Haiti, posted to the Noriegaville News site last night. Another thing I learn from Ornstein's article is that were CAG to be an authentic Panama corporation -- which they may or may not be -- whether they are doing what I think they are or what they claim they are, it looks to be illegal under Panamanian law. (I am in touch with Rogelio Cruz Rios to sort out whether CAG, S.A. has anything to do with the Sendecki-Fullerton-Reuther ops going on in Haiti.) And also, Ornstein remarks that were any Top Cat Marine Security boats to be built in Panama, or copy-cats of TCMS boats, it would be illegal under Panama law to export such patrol boats to Haiti. 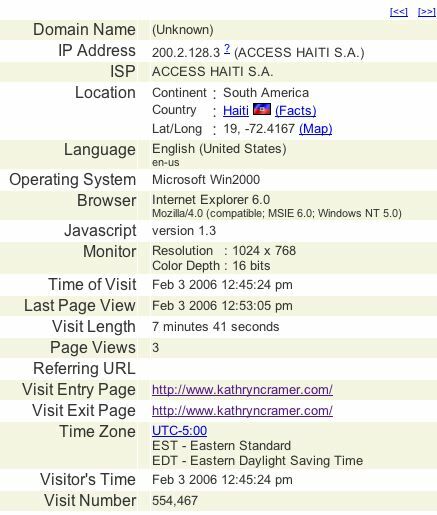 ALSO, following the revelation that the IP address 200.2.128.3 was shared by "David Reuther" trolling in my comment section, "CAG Haiti" denouncing me in comment sections across the blogosphere, and some bored and homesick Brazilian Peace Keepers in Port au Prince, I made some direct inquiries as to whether 200.2.128.3 could be an IP used by the UN Brazilian Peace Keeping Forces, and whether Valerie Sendecki, Jay Fullerton, and David Reuther of CAG were using the office computers of Brazilian Peace Keepers to post their blog comments. I do not yet have a definitive answer to that question. But 200.2.128.3 stopped its relentless visits to my site yesterday afternoon. "Do not look a gift horse in the mouth." "Always have a plausible denial handy." This oracular pronouncement sounds more like the answer of a retired CIA agent than a retired FSO. Who can tell? David Reuther, the retired government servant, has also complained in print that retired FSOs just don't make enough money. Back when I was the wife of a US Foreign Service Officer, we were not exactly rolling in dough, so I'm sure his complaint about his remuneration in retirement is legitimate. Nonetheless, it appears to me that our man Reuther was hurting for money not long ago. I would be interested to receive pictures of any of these people. Finally, I guess I should add that I have no opinions on the relative merits of Haitian presidential candidates, and that in general, in the grand scheme of things, I have a vaguely positive opinion of the United Nations and its efforts in the larger world as a whole. My focus is and has been on the role of private military and security companies. I believe that PMCs can have a legitimate role in international peacekeeping. But only legitimate companies can have a legitmate role, and legitimate companies have valid addresses and identifiable management teams and verifiable corporate registrations. A company which lacks all three has no place in Haiti right before the elections. UPDATE: I was furnished the email address of David Wimhurst of MINUSTAH by a journalist and I wrote to him and asked to submit a list of questions. I specifically mentioned my concern that CAG was using Brazilian Forces office computers. He sent back a letter intended to intimidate me, specifically declining to answer my questions. He sent along two slide from a PowerPoint document that he claims are the "unaltered" versions of the screen shots posted on my site. I have asked whether "David Reuther" was acting on Wimhurst's behalf in any capacity when Reuther wrote to me. Gee, I feel so naïve. I thought the purpose of press offices was to answer questions. Guess not in Haiti. UPDATE: See A Response to MINUSTAH's David Wimhurst. The go-fast boat is the generic name for the drug smuggling boat of choice in many parts of the world in the 1990s and first years of the 21st century. The name is also more widely used for high performance craft of the characteristic design. To all you boat photographers out there: send me your pix of go-fast boats. I am specifically interested in receiving photos of go-fast boats in the areas of Haiti, Columbia, and also Somalia. Please provide as much accompanying information as possible, especially about location, date, time, and the context of the photo. I'd like to do a little photo essay, but I need your help! Submissions should preferably come via email, but photos can also be mailed to P.O. Box 78, Pleasantville, NY 10570. December 6, 2005: The caginternational.com domain name is registered. December 13, 2005: The CAG web site touts the corporate security clearances and credit rating, but gives no address or phone number. I ridicule them for their lack of transparency. January 20, 2006: The CAG web site has dropped claims of security clearances and credit ratings and has added an address in Tampa and an address in Panama plus a "message center" phone number. Under scrutiny, both street addresses seem to be some form of message center. On January 18th, I had published a post which began, "I seem to have uncovered a strange little black ops organization that's spying in Haiti and elsewhere. " Even if Rogelio Cruz Rios were the registrar of their corporation, it may mean nothing. I find it really curious that CAG would rather pull info off their web site than answer questions about their association with him. 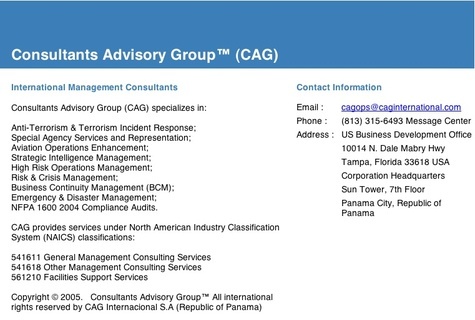 If CAG has a different registered corporate name in Panama than CAG, S.A. then presumably they could say so. And even if this is he right name, the nature of the relationship could mean little. So why go "UNDER CONSTRUCTION"? February 1, 2006: Back to PÁGINA BAJO CONSTRUCCIÓN. This time without details. Why are these guys so wedded to the corporate name? Have they been using it as a tax shelter on their US tax returns or something? I can't think of any other explanation. PANAMA CITY -- Panama's top law enforcement officer, Attorney General Rogelio Cruz Rios, may have assisted a Colombian cocaine cartel by releasing more than $1 million frozen in the cartel's bank accounts here, according to U.S. and Panamanian officials. The officials said Cruz unfroze bank accounts that the U.S. Drug Enforcement Administration believes were used in a money-laundering operation by the Cali cartel, Colombia's second-largest cocaine-trafficking syndicate. 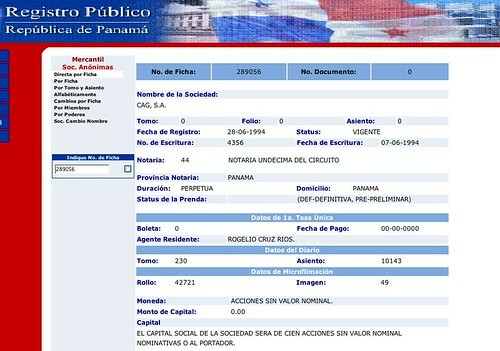 According to a subsequent ruling by the Panamanian Supreme Court, Cruz did not have the authority to take such action. U.S. officials acknowledged that Cruz's action has, at the very least, set back efforts to curtail Colombian drug operations here. The United States invaded Panama and installed a pro-American government in 1989 with the express purpose of eradicating this country's high-level cooperation with Colombian drug traffickers. Since this differs from the full corporate name given by Sendecki, it is possible that this is not the same company providing apparent espioage services in Haiti. But if it's not the same company, then it appears that I was not given the straight story about Consultants Advisory Group being a corporation registered in Panama. If I've got the wrong CAG, I suggest that the company's representatives come forward with better information. 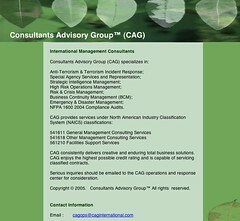 Consultants Advisory Group™ (CAG): A Security Company Born Every Minute? Following the New Orleans disaster, a lot of us were wondering where all that money for "homeland security" went, since not much securing of the homeland seems to have taken place. I think I'm beginning to understand. NFPA 1600 2004 Compliance Audits. CAG consistently delivers creative and enduring total business solutions. CAG enjoys the highest possible credit rating and is capable of servicing classified contracts. So how long has this venerable company, boasting of the highest possible credit rating and the capability of servicing classified contracts been around? I'll have you know, its been around an entire week! How many more of these dubious security companies are there, anyway? CAG is not a recipient of any US public funds so we are entitled to privacy as anyone else is. How could our work be against the best interest of the United States? Though I had made no mention of Top Cat in our exchange, my CAG correspondent volunteered that CAG is not selling Top Cat Marine Security's predator style Cobra boats to Haiti, but only recommending their purchase. As far as I know, neither Top Cat nor CAG are registered with or licensed by the Department of State to export items covered the US Munitions list, as the boats in question are. I was not informed who the intended export broker was to be. That is not public information. I find it extremely interesting that there seems to be a whole emergent little industry of companies like Top Cat and CAG for whom the very concept of transparency is an abomination. At the least, a dummy company ought to create the appearance of activity, with an office and a valid mailing address, he said. "A cover that falls apart on first inspection isn't very good. What you want is a cover that actually holds up . . . and this one certainly doesn't." I realized when I woke up this morning that when writing my post Is This World a Little Too Small?I had misread IOL's discussion of Raymond Stanley Archer. His testimony at the N4610 trial does not so much suggest that he worked for the American security company the Steele Foundation (which guarded Aristide prior to his removal from power), but rather that he was with Aristide after or perhaps even during. One of the 70 alleged South African mercenaries on trial in Zimbabwe was guarding deposed Haitian president Jean-Bertrand Aristide days before he was taken into custody. . . . He said he had arrived back in South Africa three days earlier after an assignment as a bodyguard to Aristide . . . when a man whom he identified as James Kershaw contacted him on his cellphone. On March 1st, Aristide was flown directly from Haiti to Central African Republic in a US chartered jet. He does not leave CAR for Jamaica until March 15th, by which time Archer is already in jail. So there are only a few possibilities here: (1) I was right in the first place; Archer worked for Steele even though Steele's usual folks are former US special forces. (2) Archer was in Haiti and then in CAR with Aristide. Or (3) Archer was with Aristide only in CAR. Of the three possibilities, number 3 makes the least sense, because Archer is finished with the job and home by March 4th. And if he worked for Steele (1), wouldn't there have been fuss about American involvement if one of the men on N4610 had been employed by a US private military firm less than a week earlier? What looks most likely is that Archer's assignment was to help get Aristide out of Haiti to CAR; that he was part of the group that escorted/abducted (depending on your source) Aristide from Haiti. Mr Powell insisted: "He was not kidnapped. We did not force him onto the airplane. He went onto the airplane willingly. And that's the truth." Aristide's phone calls to the outside world immediately following his flight were apparently placed on a cell phone that had been "smuggled" into his room, so I doubt he did the booking, (unless of course Archer worked for Steele). So this leaves us with a number of questions: First of all, how did a man who would have been vetted for security work either by a reputable US security firm or by the US government end up on N4610? Secondly, were any of the 10 men Archer said he recognized among the N4610 bunch similarly vetted? And had they had similar recent employment? And finally, who is "James Kershaw"? The darkest interpretation of this odd linkage is that Archer is some kind of coup specialist, experienced at escorting heads of state from their home countries into exile. UPDATE: In the comments on a nearby post somone who claims to have worked for Steele identifies Archer as a former Steele employee. Thanks! Is This World a Little Too Small? I've been reading the coverage of the N4610 trial, waiting for something interesting to happen. The defense has concluded its arguments; the mercenaries will not be extradited to Equatorial Guinea. Harare - One of the 70 alleged South African mercenaries on trial in Zimbabwe was guarding deposed Haitian president Jean-Bertrand Aristide days before he was taken into custody. Raymond Stanley Archer told a makeshift court in Zimbabwe's maximum security jail on Thursday that he was having lunch with his ex-wife in Johannesburg when he got a phone call offering him a job to guard a mine. He said he had arrived back in South Africa three days earlier after an assignment as a bodyguard to Aristide - who has since been granted temporary asylum in South Africa - when a man whom he identified as James Kershaw contacted him on his cellphone. "He said if I could get to the airport within an hour, I could have the job. I met the rest of the accused and flew out. I had met about 10 of them before. "As far as I was concerned, we stopped in Harare to refuel." Now, I know it's a Small World After All, but wasn't a San Francisco-based company provinding Aristide's security? Wasn't it the Steele Foundation? Did Raymond Stanley Archerwork for Steele? How peculiar. MEANWHILE, Derek Davids (aka Johnathan Constable), chief executive of International Intelligence Risk Management, has been released by South African police following a raid of his company's offices for suspected mercenary activity. destroy the purity of Afshar's "which-way" measurement? images of the pinholes with nothing in between and are indistinguishable. diffraction grating. Bohr is still wrong. Cramer says ( see his power point ): Copenhagen-influenced expectation: The measurement-type forces particle-like behavior, so there should be no interference, and no minima. Therefore, 6% of the particles should be intercepted. This means (following Cramer) that Bohr will predict that there is no interference in front of the lens. 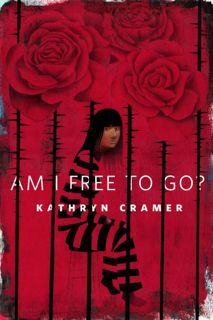 But I have a reply evident to Cramer : Are you sure that you have a which path experiment ???? If you have such proof (I have the proof of the opposite) I think that Afshar could give you his 1000 $ (that he proposed to me and to others ) because you will prove in the same time that Schrodinger equation is wrong or that 1+1 =3. Raymond Archer was an employee of the Steele Foundation he had been hired sometime around March or April of 2003. He is not a coup specialist...he was hired as part of the dignitary protection team assigned to protect aristide. The protection team was an international team consisting former US military, former British military, and a few former South African Special Forces. I am surpised by the presence of th South Africans, since the news reports I had read of the Steele Aristide group portrayed them as exclusively US special forces. When you say "The protection detail was forced to leave by the U.S. with Aristide," I presume that what you mean by "with" is simultaneous with, as opposed to accompanying; which is to say that you are not telling me they were forced onto the plane with him? In principle, the use of mercenaries has been banned since 1989 by the International Convention against the Recruitment, Use, Financing and Training of Mercenaries, 4 December 1989, an additional protocol to the Geneva Convention. Nineteen countries have ratified the Convention: Azerbaijan, Barbados, Belarus, Cameroon, Cyprus, Georgia, Italy, Maldives, Mauritania, Qatar, Saudi Arabia, Senegal, Seychelles, Suriname, Togo, Turkmenistan, Ukraine, Uruguay, and Uzbekistan. An additional nine have signed but have yet to ratify the Convention: Angola, Congo, Democratic Republic of the Congo, Germany, Morocco, Nigeria, Poland, Romania, and Yugoslavia. The US and UK, each with a huge private military industry, are notable for their absence as signatories. We should ask John Kerry to commit in favor of the US signing this convention. I started this post -- concerning the role of private military companies and mercenaries in Iraq yesterday. But I was so shocked at what I was finding that I had to sleep on it before I could continue. The sight of a mob of Iraqi stone-throwers attacking the gates to the Basra palace where the coalition has its southern headquarters is no surprise. What's odd is the identity of the uniformed men holding them off. The single Briton prodding his six Fijians to stand their ground are not British army soldiers but employees of Global Risk Strategies, a London-based security company. Private military companies ( PMC s)—mercenaries, in oldspeak—manning the occupation administration's front lines are now the third-largest contributor to the war effort after the United States and Britain. British ones are popular, largely because of the reputation of the Special Air Service (SAS) regiment whose ex-employees run and man many of the companies. They maintain they have twice as many men on the ground as their American counterparts. According to David Claridge, managing director of Janusian, a London-based security firm, Iraq has boosted British military companies' revenues from ��200m ($320m) before the war to over ��1 billion, making security by far Britain's most lucrative post-war export to Iraq. Many companies operate from villas in middle-class areas of Baghdad with no name on the door. Some security men claim they can earn more than ��80,000 a year; but short-term, high-risk mercenary work can bring much higher rewards. Security personnel working a seven-day contract in cities like Fallujah, can make $1,000 a day. Another British-owned company, ArmorGroup has an ��876,000 contract to supply 20 security guards for the Foreign Office. That figure will rise by 50 per cent in July. The firm also employs about 500 Gurkhas to guard executives with the US firms Bechtel and Kellogg Brown & Root. While Armor's products division is tied to law enforcement, its security division -- ArmorGroup Services -- is more closely allied with the world of espionage. That's why it is useful to have former KGB members such as Mikhail Golovatov, former head of the Alpha Group -- the KGB's counter-mafia and counter-terrorism unit -- on the Armor payroll in Russia. "I'm very happy with the progress Armor is making and what the company is doing with its business mix. That should show up in its numbers in the next nine months to a year," he said. Armor executives, meanwhile, say recession or an economic downturn shouldn't hold the company back. In fact, Latin America's economic doldrums are carving out new business possibilities for Armor, and in the near future it plans to open a Miami office to run its Latin American operations. "Multinational companies always tend to have money to spend to protect their physical and personal assets," Spiller said. "Our business can only get better as people become more aware of the risks." British mercenary firms have made an estimated ��800m from providing private armies for security duties in post-Saddam Iraq, and now qualify as the UK's most lucrative export earner from the country in the past year. Armed mercenaries being paid out of government or corporate funds outnumber the Army's 8800-strong garrison in the country by "at least a factor of two", according to concerned military sources. Senior sources also say there are more ex-SAS soldiers acting as advisers for "private military companies" than currently serving in the elite, 300-man regiment based near Hereford. A group of American construction executives was traveling in a convoy down a palm-lined highway 30 miles north of Baghdad one January day when gunfire and rocket-propelled grenades suddenly exploded everywhere. Private security agents riding with the convoy fought off the attackers in a hail of gunfire. Two of the agents died, as did an unknown number of guerrillas. The bloodshed was not publicly reported at the time, and the agents' employer, the Steele Foundation of San Francisco, drew a cloak of discreet silence over the incident to protect its clients' identity. The shootout was just one more example of the behind-the-scenes role played in Iraq by an estimated 15,000 private security agents from the United States, Britain and countries as varied as Nepal, Chile, Ukraine, Israel, South Africa and Fiji. They are employed by about 25 different firms that are playing their part in Iraq's highly dangerous postwar environment by performing tasks ranging from training the country's new police and army to protecting government leaders to providing logistics for the U.S. military. "The rate of growth in the security industry is phenomenal," said Deborah Avant, a professor of political science and international affairs at George Washington University in Washington, D.C. "If you had asked a year ago whether there would be 15,000 private security in Iraq, everyone would have said you're nuts. It has moved very quickly over the past decade, but Iraq has escalated it dramatically." The boom in Iraq is just the tip of the iceberg for the $100 billion-a- year industry, which experts say has been the fastest-growing sector of the global economy during the past decade. From oil companies in the African hinterland to heads of state in Haiti and Afghanistan to international aid agencies in hotspots around the world, the difference between life and death is decided by private guns for hire. "We scour the ends of the earth to find professionals - the Chilean commandos are very, very professional and they fit within the Blackwater system," he said. Chile was the only Latin American country where his firm had hired commandos for Iraq. He estimated that "about 95%" of his work came from government contracts and said his business was booming. "We have grown 300% over each of the past three years and we are small compared to the big ones. "We have a very small niche market, we work towards putting out the cream of the crop, the best." The privatisation of security in Iraq is growing as the US seeks to reduce its commitment of troops. USA Blackwater isn't the only security firm hiring ex-military of disturbing origin. Last month, The Forward's Marc Perelman reported that contractor Erinys International utilized "former henchman of South Africa's apartheid regime" to guard oil facilities and train new Iraqi police. "Franois Strydom, who was killed in the January 28 bombing of a hotel in Baghdad, was a former member of the Koevoet, a notoriously brutal counterinsurgency arm of the South African military that operated in Namibia during the neighboring state's fight for independence in the 1980s. His colleague Deon Gouws, who was injured in the attack, is a former officer of the Vlakplaas, a secret police unit in South Africa," wrote Perelman. Who would have thought that Iraq needed to import torturers! Military analyst Henri Boshoff, of the Institute for Security Studies, told IRIN reports that up to 1,500 South Africans could be operating in Iraq were "speculation - 1,500 is a lot of people and I'm sure [South African] customs would have picked it up". The recruitment of its citizens, however, isn't making either the Chilean or the South African governments happy. The Regulation of Foreign Military Assistance Act prohibits South African citizens from direct participation as a combatant in armed conflict for private gain. Michelle Bachelet, Chile's defense minister, has ordered an investigation into whether such recruitment is legal under Chilean laws. Bachelet also was troubled by stories that soldiers on active duty are leaving the company to sign up as mercenaries. It is also only a matter of time before U.S. soldiers grow unhappy with the presence of mercenaries in their midst. The high salaries and shorter terms of employment offered to mercenaries will inevitably make a serious dent on the military's budget. As Blackwater's Jackson acknowledged in the Guardian, "If they are going to outsource tasks that were once held by active-duty military and are now using private contractors, those guys [on active duty] are looking and asking, 'Where is the money?'" This last question seems to be very much in the minds of the new Iraqi security forces the U. S. trains, half of whom leave over issues of pay. "This is a very touchy issue," said a high-level coalition military official who opposes expanded use of private soldiers in Iraq. "There's a lot of pressure to use these contractors. Some oppose it. Some support it." Some soldiers said privately that the soldiers-for-hire walk around with their weapons in full view as if they belong to a coalition army. They worry that the private-sector soldiers might not be constrained by the same rules of engagement and that any rogues among them who kill or hurt Iraqis could bring reprisals on all foreign forces. "What are the rules of engagement [for the PMCs]?" asked one coalition military official in Baghdad. "Are they civilians or are they military? I don't know who they are, and I don't want to go anywhere near them." The Coalition Provisional Authority did not respond to several formal requests for information about private military activities in Iraq. The coalition military commander in Iraq, U.S. Lt. Gen. Ricardo Sanchez, responding to a question at a press conference several weeks ago, said he did not know of any plans to use contractors to perform security functions for the military. On the ground, however, the private soldiers are occasionally finding themselves in firefights with Iraqis. Richard Galustian of Pilgrims, a contractor that provides security for many Western media outlets, described one incident in which his firm's security officials opened fire on a group of suspected bandits along the road from Baghdad to the Jordanian border. "Certainly at least one or two people were hit," he said. A former Special Forces member now in Baghdad said military contractors guarding ministries on behalf of coalition authorities have killed Iraqis who were trying to loot or attack the buildings. "It's Iraq," he said. "You're accountable to nobody. But I guess ultimately you're accountable to the U.S. military for what happens." Although subcontracts are on offer in Iraq, few foreign companies have chosen to set up in the country as instability continues and facilities such as hotels come under attack. A U.S. engineering executive doing business in the Gulf said his company has been offered subcontracts in Iraq but turned them down. "Nobody is exactly rushing to go into Iraq," the executive said. Who needs trade anyway when war for war's sake is making such a profit? And what will we do for Bad Guys when they've all gotten jobs in Iraq? Will a Bad Guy just be a thug with out a job? Seriously, the US and the UK are squandering two hundred years of emergent citizenship, patriotism, and respect for the nation-state for political expediency and the financial gain of their mercenary and oil industries. The mercenary situation is way out of control. WASHINGTON (CNN) -- Iraq is becoming a major "magnet" for al Qaeda terrorists, who now pose more of a threat than remnants of Saddam Hussein's Baath Party, two analysts said Tuesday after a truck bomb killed 17 at the U.N. headquarters in Baghdad. "The officials use words such as 'magnet' and 'super magnet' to describe the attraction that Iraq has for al Qaeda and other 'jihadists,' " said Bergen, author of "Holy War, Inc.: Inside the Secret World of Osama bin Laden." James Rubin, a former U.S. deputy secretary of state, agreed that the terrorism milieu in Iraq has changed, pointing to increased attacks against civilian targets and fewer large-scale attacks against U.S. soldiers. "It is my suspicion that the types of attacks in Iraq are either backed or funded by Islamic extremists." They are coming from other countries and "see it as a rich place to conduct their bloody business," he said. I'm having one of those experiences when I discover that the world as it actually is is very different from my conception of it. I want my worldview back. A voter survey tied to a Republican effort to raise money for House candidates mislabels Thailand and the Philippines as countries that "harbor and aid terrorists," say officials from both governments. A question on the National Republican Congressional Committee's "Ask America 2004 Nationwide Policy Survey" asks: "Should America broaden the war on terrorism into other countries that harbor and aid terrorists such as Thailand, Syria, Somalia, the Philippines, etc.?" Accompanying the NRCC survey, which also poses questions about health care, the economy and other issues, was a four-page letter signed by House Speaker Dennis Hastert, R-Ill., that seeks money to help "keep the Republican Party in control of the U.S. House." [Brig. Gen. Mark Kimmitt, the U.S. military's deputy director of operations] added that "the contractors stand side by side with the Iraqi security forces, side by side with the coalition forces. Every time they go out, they know they're taking risk; and they're willing to take that risk for many, many reasons, one of which, they understand that they're part of this process of bringing this country a future that they have not had for 35 years." I don't dare hope that any reporter will be astute enough to ask directly if they worked for any of the myrid PMCs. RIDDLE: When is a civilian contractor not a civilian? And when is a dead civilian contractor not a civilian casualty? AND MEANWHILE: There ahve been coup attempts in Congo (link via African Oil Politics) and Sudan (both links by subscription). Trackbacks: Hobson's Choice, Anita's LOL, Making Light, & BoingBoing.